In this article James Clayton looks at the role that gas detection plays in safe systems of work for confined space entry. The term confined space covers a great variety of workplaces that have limited access points and inadequate ventilation. They are, therefore, potentially dangerous places in which to work: they may trap hazardous concentrations of toxic or flammable gases or vapours; or be deficient in oxygen. Understanding the nature of the atmosphere in confined spaces is critical to ensuring worker safety. A number of people are killed or seriously injured in confined spaces each year in the UK. Most of these tragic cases are well documented, and in particular an incident in May 2014 highlighted the need for effective gas detection. While the timber cargo on board a general cargo vessel was being discharged, three crewmembers entered a cargo hold access compartment 1 . It is likely that the second and third crewmembers entered the space to attempt to rescue their colleagues. Another crewman saw one of his colleagues collapse in the compartment and raised the alarm. A frantic rescue operation ensued. During the recovery of the three unconscious crewmen, safety equipment was used incorrectly. As a result, the three crewmen did not survive. On investigation it was discovered that although the oxygen level at the access compartment entry was normal, within the compartment it had been depleted. This was potentially caused by the timber cargo, with oxygen levels of 5% to 6% recorded at the compartment deck. The vessel had no rescue plan or appropriate rescue equipment in place. Preventing entry into a confined space, and therefore removing the need for gas detection, should always be the first consideration. In every situation, you must think about the measures that can be taken to enable the work to be carried out properly without the need to enter the confined space. These measures might involve modifying the confined space itself to avoid the need for entry, or enabling the work to be undertaken from outside the space. In many cases it will involve modifying working practices. Gas detection can play a role in preventing the need for confined space entry through testing the atmosphere or sampling the contents of confined spaces from outside using appropriate long tools and probes. In determining the type of gas detection and atmospheric monitoring needed, it is critical to assess the general condition of the confined space. You must identify what might be present or not present and cause a problem; for example, is the concentration of oxygen normal or is there any evidence of damage or corrosion? Consideration should be given to the following areas. Information about any substances previously held, however briefly, in the confined space, will give an indication of what kind of hazard may be expected, for example, toxic or flammable gases. Fires and explosions have been caused by ignition of substances thought to have been removed a considerable time before, but which were, in fact, still present. Dangers may arise from chemical residues or scale, rust, sludge, or other residues in a confined space. For example, dangerous gas, fume or vapour can be released when scale, sludge or animal slurry is disturbed. Where there are residues, safe working procedures should assume that disturbance of the residue will release gas, fume or vapour. "depending on the results of the risk assessment, testing the air may be necessary to check that it is free from both toxic and flammable vapours and that it is safe to breathe"
Contamination may arise from adjacent plants, processes, gas mains or surrounding land, soil or strata. Gases and liquids may leak, or may have leaked, into the confined space from adjacent plants, installations, processes or landfill sites. 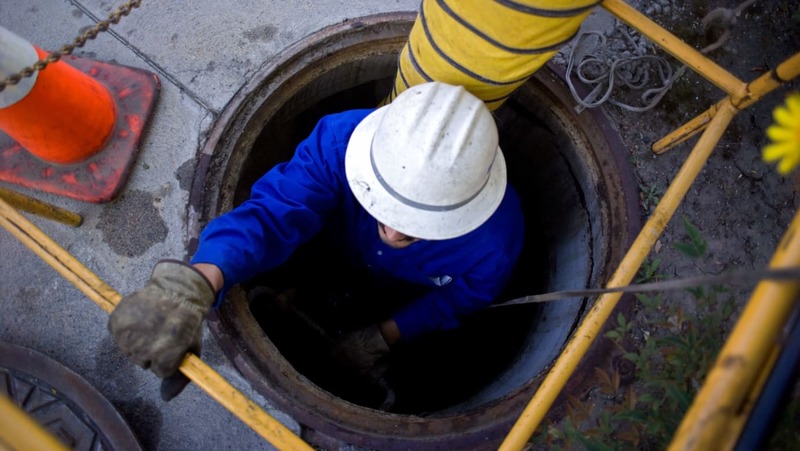 This is a particular risk where confined spaces are below ground, because they can be contaminated by substances from installations many metres away. In certain situations, water in ground strata and/or gases may enter the confined space from the surrounding land, soil or strata. Acid groundwater acting on limestone, for example, can lead to dangerous accumulations of carbon dioxide. Methane can occur from a number of sources including the decay of organic matter and can be released from groundwater. Methane and other gases can leach into groundwater and be released at distances remote from the source. Sewers can be affected over long distances by water surges, for example, following sudden heavy rainfall upstream of where work is being carried out. There are substantial risks if the concentration of oxygen in the atmosphere varies significantly from the normal level of 20.9%. For example, oxygen enrichment will increase flammability of clothing and other combustible materials. Conversely, a relatively small reduction in the oxygen percentage can lead to impaired mental ability, and can adversely affect others with pre-existing medical conditions such as respiratory infections. The effects are very rapid and generally there will be no warning to alert the senses. This can happen even in circumstances where only a person’s head is inside a confined space. Very low oxygen concentrations (below 16%) can lead to unconsciousness and death. Any difference in oxygen content from normal should be investigated, the risk assessed, and appropriate measures taken in light of the risk. Particular care should be taken in environments with a specifically reduced oxygen concentration created by removing oxygen or increasing concentration of another gas, usually nitrogen (a hypoxic environment). This should include restrictions on access and alarm systems to alert workers when oxygen limits drop below a safe limit. Hazards from the work itself and from outside the space should also be considered. Among these are the use of cleaning chemicals, increased temperatures, and an ingress of substances. You should assess the requirements for emergency rescue arrangements. Possible emergencies should be anticipated and appropriate rescue arrangements made. The likely risks, and therefore the equipment and measures needed for a rescue by nearby employees, must be identified and the equipment made available for use. Depending on the results of the risk assessment, testing the air may be necessary to check that it is free from both toxic and flammable vapours and that it is safe to breathe. Testing should be carried out by a competent person using a suitable gas detector that is correctly calibrated. Where the risk assessment indicates that conditions may change, or where further precautions are deemed necessary, continuous monitoring of the air may be needed. Testing should be carried out by people who are competent in the practice, are aware of the existing standards for the relevant airborne contaminates being measured, and are also instructed and trained in the risks involved in carrying out such testing in a confined space. Those carrying out the testing should also be capable of interpreting the results and taking any necessary action. Records should be kept of the results and findings. The choice of monitoring and detecting equipment will depend on the circumstances and knowledge of possible contaminants and you may need to take advice from a competent person when deciding on the type that best suits the situation. When testing for toxic or asphyxiating atmospheres, for example, suitably calibrated chemical detector tubes or portable atmospheric monitoring equipment may be appropriate. Monitoring equipment should be in good working order. Where necessary, it should be calibrated and tested at least in accordance with the manufacturer’s recommendations, or in line with some other schedule (as identified from the findings of the risk assessment) that may differ from the manufacturer’s requirements. Testing and calibration may be included in daily operator checks (a response check) where identified as necessary. "atmospheric monitoring equipment must be properly maintained. It should be tested, inspected and where necessary calibrated"
Where there is a potential risk of flammable or explosive atmospheres, equipment specifically designed to measure for these will be required. All such monitoring equipment should be specifically suited for use in potentially flammable or explosive atmospheres. Explosimeters and flammable gas monitors must be calibrated for the different gases or vapours that the risk assessment has identified could be present and these may need alternative calibrations for different confined spaces. The manufacturer will be able to identify the appropriate calibrations for the possible gases. Prior to entry, the atmosphere within a confined space should be tested to check the oxygen concentration as well as for the presence of hazardous gas, fume or vapour. Testing should be carried out where knowledge of the confined space, taken for example from information about its previous contents or chemicals used in a previous activity in the space, indicates that the atmosphere might be contaminated or to any extent unsafe to breathe. Testing should also be carried out if the atmosphere was known to be contaminated previously, was ventilated as a consequence, and needed to be tested to check the result. Inhaling an atmosphere that contains no oxygen can cause loss of consciousness in a matter of seconds. Testing to measure the oxygen content should be carried out before testing for concentration of flammable gases, followed by any further tests for toxic gases, vapours and dusts. Additional tests may be required for the presence of contaminants in liquid or solid form when the risk assessment indicates that they may be present. Some flammable substances also have toxic properties, which may need to be considered as part of the testing process. Where the atmosphere in the space may not be safe to breathe and requires testing, the findings of the risk assessment should indicate whether testing should be carried out on each occasion that the confined space is re-entered, even where the atmosphere was initially found to be safe to breathe. Regular monitoring may be necessary to ensure that there is no change in the atmosphere while the work is being carried out, particularly where there is a known potential for adverse changes during the work. The conditions should be continuously monitored when, for example, forced ventilation is being used, and where the work activity could give rise to changes in the atmosphere. The exact testing, re-testing and monitoring requirements should be defined by a competent person within the safe system of work. This regular monitoring of the atmosphere in a confined space may be carried out using fixed monitors within an area to protect a number of workers or through the use of personal, portable monitors. The atmosphere in a confined space can often be tested from the outside without the need for entry, by drawing samples through a long probe. Where flexible sample tubing is used, ensure that it is not impeded by kinks, blockages or blocked or restricted nozzles, and that sufficient time is allowed for samples of the atmosphere to displace the normal air in the probe. The atmosphere in sufficiently representative samples of the space should be tested to check for pockets of poor air quality, especially if there is any doubt about the thoroughness of ventilation. If it becomes necessary for the tester to enter the confined space, the work then should be carried out in accordance with the advice in this guide. Atmospheric monitoring equipment must be properly maintained. It should be tested, inspected and where necessary calibrated, either in accordance with the recommended intervals and procedures accompanying the equipment or, if these are not specified, at such intervals considered suitable. The manufacturer’s instructions, where they are available, should also be consulted. It is best to keep records of all testing, inspection and calibration. BS EN 60079-29-2:2007 3 has been specifically written to cover all the functions necessary: from the need for gas detection all the way through to on-going maintenance of a successful gas detection operation. Different clauses are appropriate for different tasks within this range of operations. As far as is reasonably practicable each clause has been written to stand-alone. The standard gives guidance on, and recommended practice for, the selection, installation, safe use and maintenance of electrically operated group II apparatus, intended for use in industrial and commercial safety applications for the detection and measurement of flammable gases complying with the requirements of BS EN 60079-29-1. The standard is applicable for oxygen measurement for the purpose of inertisation, where explosion protection is provided by the exclusion of oxygen instead of measuring the combustible gases or vapours present. BS EN 45544-3:2015 also addresses workplace atmosphere monitoring. It covers electrical apparatus used for the direct detection and direct concentration measurement of toxic gases and vapours, as well as performance requirements for general gas detection apparatus. It is clear that gas detection plays a critical role in ensuring worker safety during confined space entry. A range of different equipment is available and its use must always be based on a sound risk assessment and incorporated into a safe system of work, implemented with competent support where necessary.